We Built This City on Ham & Eggs! This perfectly portioned, deconstructed Denver omelette is ideal for breakfast, brunch, and beyond! Preheat oven to 400 degrees. Spray a 12-cup muffin pan with nonstick spray. 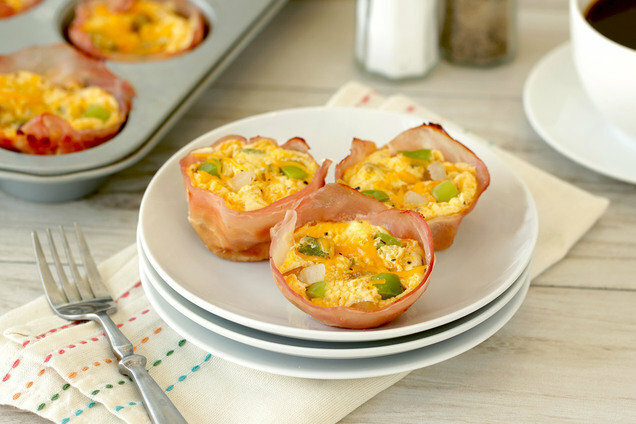 Place each ham slice in a cup of the muffin pan, and press it into the bottom and sides, slightly overlapping to form a cup. Bring a skillet sprayed with nonstick spray to medium-high heat. Add bell pepper and onion. Cook and stir until mostly softened, about 4 minutes. Transfer veggies to a large bowl. Add remaining ingredients, and stir to mix. Evenly distribute mixture among the ham cups. Bake until firm and cooked through, about 15 minutes. Hungry for More Muffin-Pan Egg Bakes? It's National Eat a Peach Day, August 22nd. Grab some fresh peaches or hit the freezer aisle, and make these 47-calorie Personal Peach Pies! Do your pals love mini foods? Click "Send to a Friend" ASAP!